The Fante Confederation of 1868-1871 looms large in the official memory and scholarly histories of Ghana. Commemorated in speeches, memorials, and school curricula as a precursor to the successful independence movement of the 1950s, its leaders and events are also a favorite topics of nationalist, social, and world historians. Yet ironically, they appear to be largely absent from the compendious oral tradition canon of Fante-speaking communities. Are these silences meaningful? Do they reflect the contingencies of history, the workings of collective imagination, or some flaw in fieldwork? Or are messages about these events and people somehow submerged into the communal memories that these communities have constructed? 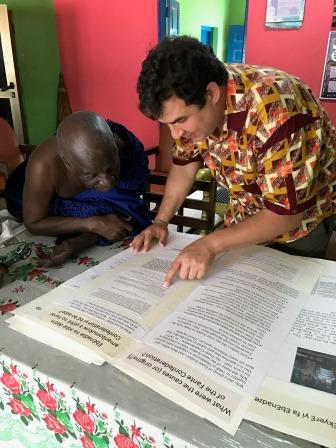 In order to answer these questions, I have undertaken a series of experiments in public history interaction with local participants that were intended to uncover the operation, history, and limits of both memories and silences about the Fante Confederation. My findings point to entangled issues of commemoration, local politics, economic development, and the use and ownership of public space. In this talk, I will describe my experiments and propose some preliminary results that have implications broader issues in historical research in Africa. I will also essay a proposed next project that is cumulative and performative and that makes use of the public spaces in which these events occurred almost a century-and-a-half ago.